Zane has always enjoyed exploring the dormant volcano near his home in New Mexico, even though hiking it is challenging. He’d much rather hang out there with his dog, Rosie, than go to middle school, where kids call him Sir Limps a Lot, McGimpster, or Uno — for his one good leg. What Zane doesn’t know is that the volcano is a gateway to another world and he is at the center of a powerful prophecy. A new girl at school, Brooks, informs him that he’s destined to release an evil god from the ancient Maya relic he is imprisoned in — unless she can find and remove it first. Together they return to the volcano, where all kinds of crazy happens. Brooks turns into a hawk, a demon attacks them in a cave, and Rosie gives her all while trying to protect Zane. When Zane decides to save his dog no matter the cost, he is thrust into an adventure full of surprising discoveries, dangerous secrets, and an all-out war between the gods, one of whom happens to be his father. To survive, Zane will have to become the Storm Runner. But how can he run when he can’t even walk well without a cane? I am a massive fan of the Percy Jackson and other series by Rick Riordan. It is something I have been reading for around seven years and I am absolutely obsessed. When Rick Riordan announced he would be publishing other authors work that is focused on own voices cultures I was so excited. I have read Aru Shah (review here) and absolutely adored it. The characters crafted and the fact that I knew nothing about the myths and mythology made me so damn happy. I had a similar experience with The Storm Runner. The Storm Runner follows Zane, a young boy who was born with one leg shorter than the other. He lives in New Mexico, has a volcano in his backyard, a beautiful dog and is the son of a Mayan God. Not only that but a prophecy has been told that Zane will be the one to bring back a trapped God. So, it’s all sprinkles and rainbows for him. I know absolutely nothing about Mayan mythology. I was interested in it in my youth but I wasn’t able to get any books on the topic. This only made reading The Storm Runner by J.C Cervantes all that more exciting. The way that they weave the mythology into the story was absolutely amazing. They really managed to let the education be both slow and fast, allowing the reader to not get lost with the Gods or myths. It is absolutely perfect for the young readers in which these books are targeted towards. This book really had it all. Betrayal, a kickass female character, family and a trio that made you laugh out loud. Oh, and really bad Gods who let kids do everything for them. I have to say one of my favourite things about this book was Zane’s dog, Rosie. She is a three-legged dog that he found wandering around in New Mexico and he brought her back from the brink of death. I really think it sets up Zane’s character as well as including an awesome dog. A lot of what Zane does throughout the book is for his dog that was incredibly interesting. She plays a pretty large part and I really do love when dogs play a part in books. I am so soft for dogs. The other thing I really loved about The Storm Runner was the familial dynamic. I know in most of Rick Riordan books there is a parent that plays a part in the child’s life, typically the mother but not always. In this book, we have an incredible mother, who disappears at one point but is still helping her son, and an uncle who joins Zane and Brooks on the adventure to basically save the world. Unlike Brooks and Zane, the uncle is simply human and absolutely hilarious. He isn’t apart of the world nor was he aware of it in any way. He really added comic relief to situations and his references to wrestling – and actually using them in real life – were pretty hilarious. I just love familial dynamics in books – both dysfunctional and good – so it was really enjoyable to see this one come together. It seemed as though Zane’s uncle was going to be an annoying character throughout the book but I was really happy that was not the end goal. There is just so much to this book. Zane uses a cane, so disabled representation which is always important in books. There is a seer that gets turned into a chicken. A torch that fries demon. 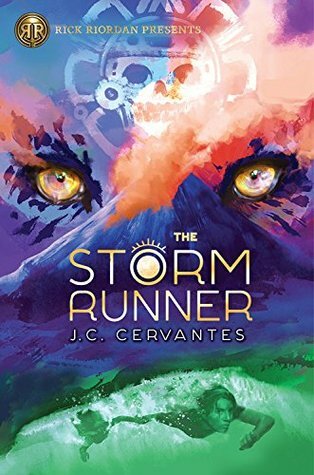 The Storm Runner really leaves you wanting more because the story that J.C created is spectacular. These books are such a fabulous way to learn about mythology you may not have been exposed to or seeing your beliefs or culture represented. Overall, The Storm Runner is a book I highly recommend. If you loved the Percy Jackson series I highly recommend the books being published under Rick Riordan’s publishing house. If you don’t care about this then buy this book for a middle grader you know. They will absolutely adore it, I promise you. J.C Cervantes managed to create an absolutely spectacular book that has you rooting for the underdog. This story is incredibly vivid and one that you will miss when you turn the final page. Ahh! I may have to read this just because it’s set in my home state! The majority of books about New Mexico are all historical or cowboys. Great review! I’m so glad you liked this one! It’s been on my TBR a while but I keep forgetting to get a copy.